Your Apple Watch taps you on your wrist to alert you when you get a notification. This is called haptic feedback. If you have trouble feeling the taps, you can increase the intensity of the haptic alerts. First, we’ll show you how to adjust the haptic feedback directly on your watch. Press the digital crown to access the Home screen. Tap the “Settings” app icon. On the “Settings” screen, tap “Sounds & Haptics”. You’ll see the volume settings on the “Sounds & Haptics” screen. Swipe up to scroll down to the haptic settings. The first thing you can do to increase the intensity of the haptic alerts is to tap the button to the right of the “Haptic Strength” indicator. 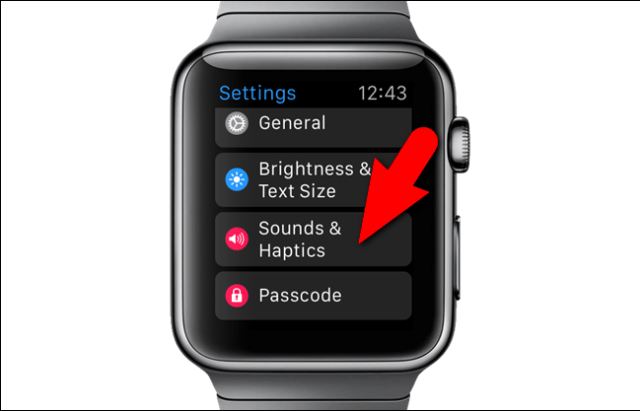 Secondly, you can add an additional haptic alert by turning on the “Prominent Haptics” slider button. This plays a prominent haptic to pre-announce some common alerts. Now, the haptic feedback is at full strength and you will receive a prominent haptic alerts as well. NOTE: You will feel the watch give you a sample of the adjusted haptics as you change the settings. These options can also be changed on your iPhone. Tap the “Watch” app icon on the Home screen. Tap “Sounds & Haptics” on the “My Watch” screen. On the “Sounds & Haptics” screen, tap and drag the “Haptic Strength” slider all the way to the right. Then, tap the “Prominent Haptic” slider button to turn that feature on.